Combining your passion for fishing with a holiday in the UK couldn’t be simpler. Here is a wide selection of UK Hotels, Guesthouses, Cottages, Holiday Parks, Camping and Caravan sites which all have fishing near by or in many cases on the grounds. For many fishermen and women nothing can beat the relaxation of a holiday fishing the rivers, lakes and coastal locations around England, Scotland and Wales. Cottages included on the site are near fishing spots or in some cases have fishing within the grounds of the cottage. Many of the holiday parks, hotels and guest houses which feature fishing will have good fishing spots with in the grounds itself. Others will be located near fishing locations or the sea. Many locations will require you to buy a fishing licence or permit. Many of the holiday locations will be able to advise as to the best way to do this and what is required to fish locally. A quick call or email before you arrive will help ensure that you do not waste valuable fishing time when you arrive. For many, there is simply no better way than fishing to get away from the pressure of a busy life. By shopping around your next fishing break needn’t cost the earth. Whether you are looking for a two week holiday or just a quick escape you are bound to find what you are looking for on the site. 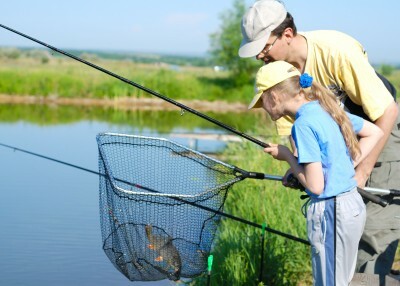 What better way to enjoy the calm relaxation of fishing with a family holiday. If you are looking to get to your holiday by rail it can be a lot cheaper to purchase discounted advance tickets where prices are often cheaper. Ferry crossings are also available if you plan to go abroad as well as a flight comparison service.